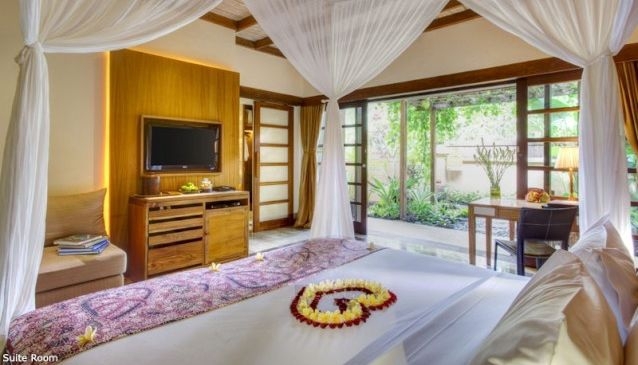 The 4 Komaneka Resorts were named to celebrate a family who are dedicated to acquiring and exhibiting one of the world's finest collections of Indonesian and Balinese art, exhibited at the Komaneka Fine Art Gallery. The first property was built in the Monkey Forest Road, a bustling street near the centre of Ubud, #Bali, popular for its wonderful shops and excellent restaurants. Komaneka Monkey Forest is surrounded by lush tropical plants, in the midst of Ubud's bustling activities, with easy access to temples, cultural performances, museums and galleries. Accommodation at this Bali Hotel is in Suite rooms and Pool Villas, with amazing forest views; dining at the Garden Terrace Restaurant overlooking the jungle. Daily afternoon tea with cakes. Pool Bar, Main Swimming Pool, Spa with Indonesian beauty and massage treatment. Lounge with computer facility, printer, books, magazine and newspaper. Fine Art Gallery & Gift, Yoga Class, Balinese Dance.